How to use photographic exposure controls? Settings selected in Render Setup > Camera will always be used (depending on whether "Use simple exposure" or "Use photographic exposure" is selected). 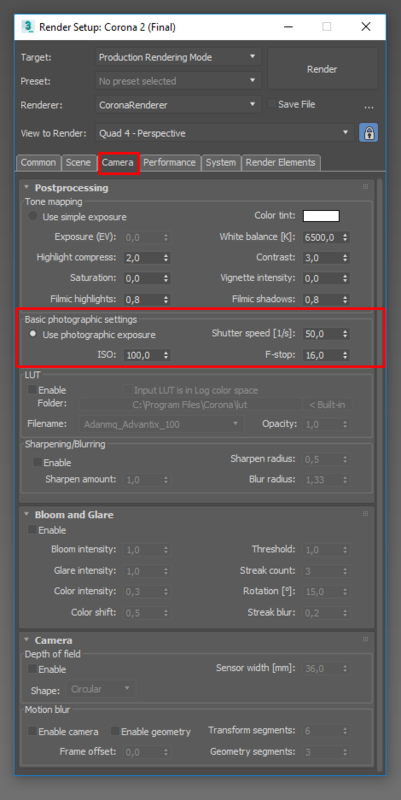 If "Use simple exposure" is selected in Render Setup > Camera, then exposure is defined in there. If "Use photographic exposure" is selected in Render Setup > Camera, then photographic settings of the Corona Camera will be considered. The EV value from the Corona Camera will be used. All settings in Render Setup > Camera are ignored. Photographic settings from the Corona Camera will be used. Note: when using exposure settings which do not consider photographic parameters, some values can still be used to determine how depth of field and motion blur should look (F-Stop and shutter speed). In such cases depth of field and motion blur appearance is independent from image exposure. Exposure (EV) slider is locked in the Corona VFB! This most probably means that you are rendering from a Corona Camera (without "Use global exposure" option) or from a 3ds Max Physical camera. Currently the exposure value cannot be controlled interactively from the VFB when rendering from those camera types.